Our daughter, Reyna Johana, will turn eight this week. She has been home with us just over a year now. The journey of bringing her into our family has been a remarkable one. When our friends ask us how we came about finding our adopted daughter, we tell them that Reyna found us. We tell Reyna that while she lived with her foster family in Guatemala, her picture traveled far and wide until it came to our family. When we first saw her bright smile, we knew in our hearts that we would bring her home. Our family of three bio boys was full of activity. Fred and I had been married for eighteen years and we had two teenagers and a nine year old in the house. Each evening at the supper table we would reach out and take hands, one with the other, to share gratitude for our good fortunes. The sixth seat, at the end of the table, was hauntingly empty. Each night I felt a silent longing to fill that spot. I needed a daughter. For the previous six years I had been reading about adoption, going to seminars, and trying to coax Fred into getting on board with the idea. I longed for a baby girl to hold and love and raise with our boys. Fred didn’t bite. The theme resurfaced every six months or so. We talked, we cried, we ached over t his issue. Fred could have been president for the Reluctant Father’s Club. He had every practical reason for us not to adopt. Our kids were reaching independence, he didn’t want a ‘second’ family, he wasn’t interested in doing diapers again, we would be facing college expenses soon, he wanted to start considering the idea of retirement-someday! Everything he said made perfect sense. My longing didn’t listen. With a weekend trip in the Spring of 2001, things took a turn. I was staying overnight with my long-time friend, Signe. We were catching a flight the next morning for Spokane, Washington to participated in the annual Bloomsday marathon. That morning, I had a vivid dream that I would meet an adoption specialist in Spokane. I shared my dream with Signe, while having coffee in her kitchen that very morning. Since we had been talking about adoption the night before, I didn’t think It too unusual that I had had such a dream. We headed for Spokane, and a mere five hours later, we were having lunch with a group of marathon walkers, one of which was a public health social worker, specializing in (you guessed it) adoption. Signe was so e3xcited that she insisted I tell my dream to everyone at lunch. The weekend progressed with a developing adoption theme. Signe’s friend, Kathy, hosted us at her home. She and her brother were both adopted as children. She took us to a Cinco de Mayo supper/fundraiser that night and introduced us to Karen Scheeringa, the founder and director of Hearts in Motion . This organization provides medical and service trips to villages in Guatemala. Karen is a dynamic mom with ten children, nine of them adopted! After the race the next morning, we all met for brunch at a local restaurant. The room was filled with folks wearing the just-earned blue Bloomsday t-shirt. About half of our group had been seated, and we were chatting away about the race. Signe asked me to share my dream with everyone, (again) since new folks were there that knew the social worker from lunch the day before. After telling it, Colleen looked a bit uncomfortable. She was directly across from me at the table. I added, “But, Colleen, I know it wasn’t you in my dream, because the gal in my dream was sitting on my immediate LEFT, and yesterday at lunch you were sitting across from me on my right.” Everyone laughed. Colleen relaxed and we went about ordering our food. Karen didn’t have a clue what the commotion was about. Once again, I shared my dream. This lady was rock-solid. This red-haired adoption queen just smiled quietly and looked me in the eye. “You come down to Guatemala and we’ll put you to work. We’ll send you home with your baby girl!” Karen gave me her card as Signe and I left for the airport. We were both so amazed with the weekend’s promise. He could see, without a doubt, that we were being led on a journey here. He could tell that I was dead serious, and that this was not open to debate. His eyes filled with tears. “Can I go with you?” is all he said. I sent word to Karen that I wanted more information regarding her volunteer service program in Guatemala, and that I felt she was our link to adopting from that country. No reply. I wanted a week and emailed again No reply. PATIENCE, I told myself. You’ve waited six years for this. Just stay calm. Then, on May 19, 2001, I checked my email before going to bed. I opened another message, and there on my screen was the smiling face of a beautiful six year old girl from Guatemala. I was looking at my daughter for the very first time! I was confused with who had sent this message. This is a a big girl, not a baby….A simple note was attached reading, “Is’t this a beautiful little girl from Guatemala? If you now of anyone that would be interested in giving her a home, please pass this on. Love, Holly.” I had no idea who Holly was! The next morning we began our search for Reyna Johana. We learned that she was listed on the RainbowKids.com website for waiting children. Her photo was posted n the site on May 3, just two days before my dream at Signe’s house. She was sponsored by Reaching Out for International Adoptions agency, in Cherry Hill, New Jersey. With a bit of digging, I discovered that a woman named Holly, from Ohio, saw Reyna’s photo on RainbowKids.com and sent it to five friends, each of which she knew from a service trip to Guatemala two years earlier. Signe’s friend in Spokane was one of those five. The service trip was sponsored by Heart’s in Motion, founded by our “Adption Queen”, Karen. Holly was our final link. I knew that Fred was not ready to bring home a baby at this place in our lives. Our family was growing up, and he was enjoying this new stage with our boys. I also knew that I could embrace this big girl., with her bright eyes and her capable smile. This girl named Reyna had come to us in a whirlwind of hope and anticipation. We knew that we were her waiting family! When I contacted Don Smith at the adoption agency, we learned that only about fifteen percent of adopting families are interested in older children. We learned that most families adopt daughters, leaving little boys for a longer wait. We also learned that we were starting the system backwards! We hadn’t even had a homestudy done and we had fallen in love with t his child. I know that Don was skeptical with our first phone call to him. He assured us that Reyna was available, but warned us that he could not hold her for us while we started our paperwork. He cautioned us that our homestudy could take several months. He encouraged us to file our application with the INS and get in line for finger-printing. By the next afternoon I had ‘interviewed’ three licensed social workers over the telephone. It was imperative that we get the homestudy started immediately. None were available for at least six weeks. We requested the work-packet from Reaching Out and began the exhaustive task of collecting family documents. The next day, I got a call from a Seattle area social worker. Her Memorial weekend vacation plans had just fallen through. Could she come up to the island on Sunday for our home visit? THIS SUNDAY???? Fred and I both took turns at the computer writing our family histories, requesting letters of reference, and running to the clinic for TB tests. By Friday night we had checked off every item on our social worker’s list and were ready to start house cleaning. I have to admit, I hired a housekeeper friend to pitch in on Saturday, and Fed got one of his employees and the boys to help him spiff up the yard. ON Saturday evening the tow of us went into the village for a glass of wine and dessert. The restaurant patio gave us a spectacular view of the western sunset and Islands beyond. We were exhausted, we were thrilled. Once the home visit was done, we still had to wait for the criminal clearance report and for the homestudy to be written. Our social worker wouldn’t write her report until she received the clearance, which could take ten day sto two weeks. Every morning the first thing I did was long-on to RainbowKids to look at Reyna’s photo. My days were filled with collecting documents, getting them certified and authenticated. Each night the last thing I did was long on again and check on Reyna’s photo. If she was still there, it meant another day that she had not been matched to a family! We were starting to feel confident that this would REALLY happen. We were in contact with Don at the adoption agency, and he was great at answering all of our questions and concerns. On the Thursday following our home visit, I got up and routinely checked the photolisting for Reyna’s smile. It was still there. I could start my day. We had compiled a lengthy list of questions for Don and I decided to call him later that afternoon. After lunch, New Jersey time, I called and got the news. Don said that Reyna had probably been matched to another family, though he needed more information from Guatemala to confirm it. I was in disbelief! How could this be? The confusion was that Reyna had not been matched with a Reaching Out family. 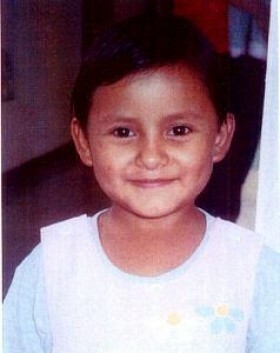 Don suspected that a family of another agency had seen her picture and gone to the Guatemala contact directly. This isn’t the typical format of the system, though it does sometimes h appen. He assured us that he would call in a few days with word one way or another. I got off the phone and logged or RainbowKids.com. Reyna’s photo was gone! My little girl was gone. Fred and I grieved all weekend. We went for long walks and cried together. I stopped at one point, on the forested country road, and said to Fred, I just wanted to touch her little face.” He held me while I wept. The following Tuesday we heard from Don. Yes, she had been matched with another family. We knew none of the details, only that we had lost our Reyna. There was a voice inside me that wanted to be open to adopting another child. Because of Reyna, we had learned that we were ready, as a family, to welcome an older child into our he arts. Perhaps her role was to lead us on t his path. I only knew that I had to follow my heart, and that meant staying on the journey. Fred agreed to continue with the dossier preparation and see where the path led. We would trust…..
Each day I spent time looking at waiting children on the various adoption sites. We focuses on little girls, four to six years old, all from Guatemala. I don’t know if it was emotional exhaustion or just feeling lost, but our hearts weren’t in it. Our hearts had been broken when we lost Reyna. I didn’t understand what we were supposed to do. What was it we were compelled to wait for? It was like being in adoption limbo land. We had received our finger printing appointment for the next week. It seemed rather pointless, but we made plans for an overnight trip to Seattle to get it done. June 15th. It was the last day of school for our High School sons. I sent them off on the ferry to the neighboring Island where they attend school. I headed to the local gym for my morning workout. I would catch a later ferry to join them for the annual awards Ceremony and pot-luck lunch. It was to be a busy day. When I got home from the gym, the phone message light was blinking. Fred had just come in and I pressed the button to find out who had called so early. We called Don and his first question concerned our homestudy. We have him the number of our social worker in Seattle. After calling her, we heard from Don again. “It looks good.” My tears let go. Our criminal clearance h ad just arrived. Our social worker would write up our report over the weekend and fax it to the agency for review and approval on Monday. On the following Tuesday, June 19th, we had our match with Reyna. It had been exactly one month since we first saw Reyna’s photo! Graham and I traveled to Guatemala in November, 2001 to meet Reyna. We spent four sweet days with her in her own country. We were able to take her foster mother to dinner and got to learn more about her life with that family, as well as visit with Reyna for 4 days. Leaving her behind was bittersweet. I think she was happy to get back to ‘normal’ with her foster family. She was in good hands, and I knew she was loved there. I think she understood that when I returned for her, I would truly be her new mama. Exactlyn nine months to the day of seeing Reyna’s picture, we became her parents. Our final decree was signed in Guatemala on February 19, 2002. I flew out on the first flight available and took a taxi to the U.S. Embassy at 7:30 in the morning. Post script: We never learned anything about the family that was matched with Reyna before us. Why they chose not to continue wit her adoption is a mystery. We will always think of them as Reyna’s guardian angel, keeping her safeguarded while she waited for our paperwork to be completed.